I really enjoy the subtle things about movies which can be used to convey emotion. “Lincoln” is another Steven Spielberg showpiece, but what made it so powerful was the extraction of an audience reaction through restraint. One would expect a movie about Abraham Lincoln’s presidency to center around the Civil War and his unfortunate assassination, but this is the first comprehensive view of the lengths Lincoln and his cabinet went to in order to pass the 13th Amendment to our Constitution. Trust me, this is not a film for the kiddos or for anyone who doesn’t enjoy watching the political process at work. Ye who is looking for rapid-fire action and bloodshed will be incredibly bored. Not having read more than a handful of reviews prior to seeing “Lincoln” I naturally expected to see epic war scenes and gripping bloody battles between the North and South. Yet, Spielberg took a different approach, opening the movie with a bloody battlefield and then allowing the viewer to draw on existing knowledge of the horrible losses during the Civil War from our scholastics. Rather than display the obvious (screaming man charging at another screaming man, stabbing each other, spilling buckets of bloody innards and dying horrible deaths) we had a very subtle reminder of the carnage in the scenes away from the battlefield. As Lincoln visited injured soldiers, a single trail of blood from a wheelbarrow full of amputated limbs was enough to draw emotion from an audience numbed to the effect of massacres from the thousands of overdone Hollywood war scenes. Spielberg’s restraint ended up arousing a more moving response, which is the measure of a brilliant director. This affection for moderation carried into the scene on Wilmer McLean’s lawn where Confederate General Robert E. Lee surrendered. Knowing most of the dialogue in this film would have to be based on 10% fact and 90% creative liberty, I was curious what the writers would choose for such an important moment in history. What happened instead was something many of us have learned in real life – sometimes words cannot express how we feel, and it is best to say nothing at all. The gentlemen removed their hats, allowed the silence to speak volumes for the defeat Lee was feeling, and history was written. I appreciate how Spielberg was able to draw so much emotion from his actors that any words at all would have ruined the poignant moment. Perhaps the most incredible restraint was in circumventing any mention of John Wilkes Booth, or re-enactment of Lincoln’s assassination. I truly expected a scene in Ford’s Theater, or some sort of character development of Booth, but neither was realized. Rather, the grey hue that had tinted every scene in the film thus far was removed for Lincoln’s final day, as we watched Mr. and Mrs. Lincoln enjoy a carriage ride in brilliant color. The darkness of the War was over, and Lincoln was enjoying his victory as the House of Representatives passed the Amendment he worked feverishly to gain support for. 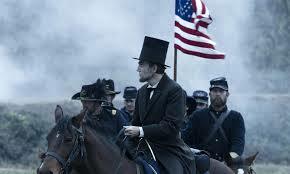 The color on screen was striking, and it was the first time I realized every moment of the film beforehand had been in a lackluster grey hue, conveying the emotional wasteland that was the Civil War. Spielberg didn’t need to show anything in Ford’s Theater, I was already in too deep. Being a lover of cinematography, I like to look for subtle cues (shadow and light, music, camera angles) that enhance the storyline the actors are portraying. While some viewers have expressed disappointment in the film, noting the lack of battle scenes and the abundance of dialogue centered around the passing of one constitutional amendment, to me this film was pure emotion and art. I find this to be incredibly refreshing, that a movie can be about so much more than fake blood, explosions, and useless chatter. The character development was necessary for us to understand how much anxiety was felt from both sides over the proposed amendment. Abraham Lincoln was a man who understood history did not cease to be written for fear of making decisions that could have a rippling effect on society – failure to act was as much a decision as acting in haste. He understood future generations would look back to that proposed amendment, knowing these men had an opportunity to grant freedom to all citizens, and no political calculation would justify letting the amendment fail. Historically, this is where the William Sewards and Edwin Stantons tend to met their match, when a president understands their leadership transcends politics. Lincoln was willing to give a giant middle finger to his entire cabinet if they provided anything less than an end to slavery, even at the expense of his popularity or his legend. The result was legendary, indeed. We don’t need a Hollywood ending to show that, as Spielberg so eloquently delivered. I hadn’t noticed the bit about Mr. and Mrs. Lincoln’s final day being in full color! Very nice article…I like how you have reviewed the film through the ‘lens’ of restraint.